Rustic and sophisticated can live together in harmony! 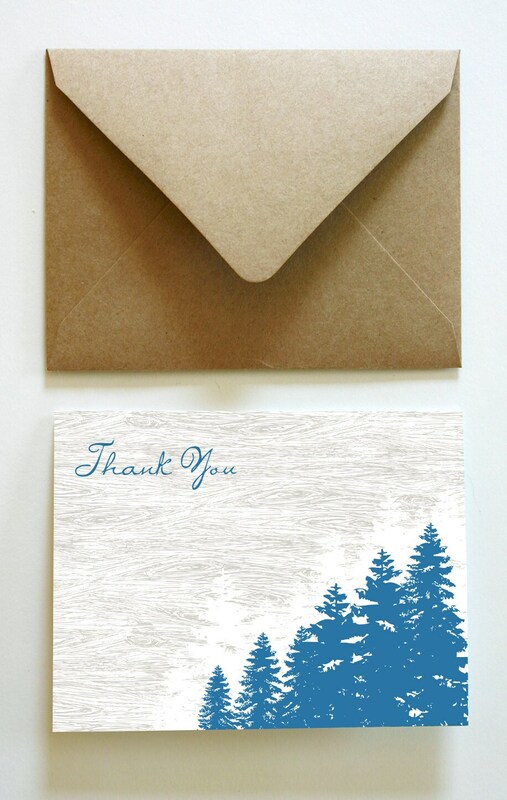 These thank you notes were designed to coordinate with our Blue Pines and Woodgrain invitation suite but are classy enough to express your gratitude for any occasion! The pewter woodgrain details make this design modern and just a touch earthy. Available in our house stock. Check our policies page for descriptions of all the papers we print on. All envelopes are included in pricing. Choose from over 100 colors and finishes. Save yourself a hand cramp and let Mountain Paper address your envelopes! It's easy! Simply purchase this listing and include any custom details during checkout. We'll work up all your art and exchange proofs with you.